This week we are highlighting a different species of turtle that is a bit funny looking: the spiny softshell turtle. These turtles are aquatic, but instead of swimming in the ocean like sea turtles, they live in freshwater habitats. 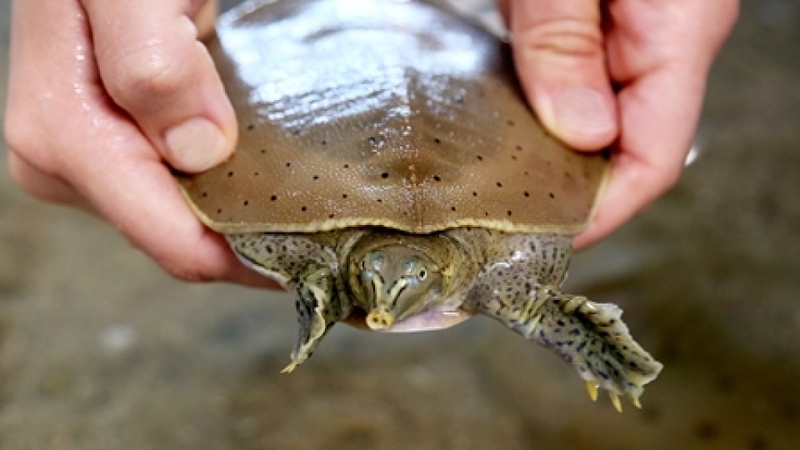 Spiny softshell turtles are found in rivers, lakes and streams located south of the Great Lakes Basin through the central and eastern United States all the way to the Gulf of Mexico. This turtle has an odd appearance. It gets its nickname, the Pancake Turtle, from its large, flat shell. Its long nose is an extra extension of its very long neck, which helps it breathe air when it wants to stay submerged underwater. This species loves freshwater habitats with a sandy or muddy bottom and little vegetation, so it can burrow under the ground and camouflage from other animals. This turtle may be unique, but it shares something in common with the largest sea turtle species, the leatherback. Unlike most turtles that grow hard shells, both the spiny softshell turtle and leatherback sea turtle have a leathery shell or carapace that lacks bony plates. 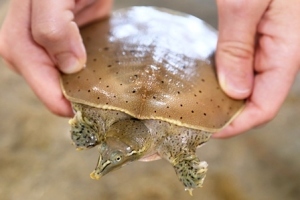 The spiny softshell turtle’s carapace feels soft and rubbery. 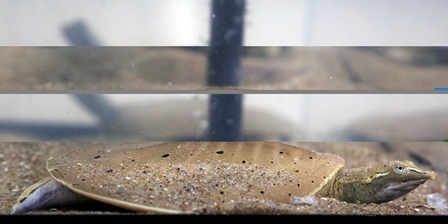 Because of its soft shell, the pancake turtle has the amazing capability of exchanging gas through its skin in both water and air. Unfortunately, this also means these turtles risk absorbing pollutants into their bodies as well. 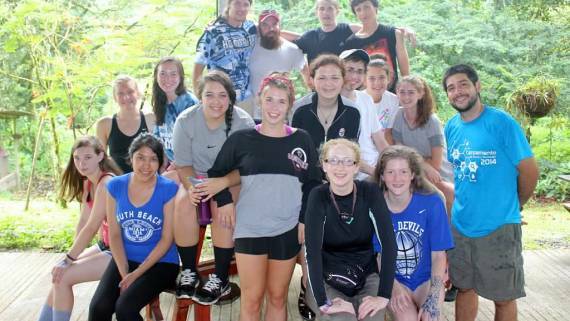 There are easy things we can all do to make sure we don’t threaten the health of these special turtles. Picking up our pet waste and not using insecticides or pesticides in our gardens ensures we are not putting excess chemicals and nutrients into our waterways. Planting rain gardens and vegetation is also a great way to add natural buffers against stormwater runoff. Stormwater runoff is water from rain that “runs off” across pavement (like roads and sidewalks) instead of naturally seeping into the ground. This runoff collects all of the pollutants on the pavement and flows into the nearest water body, like a river where many turtles live. 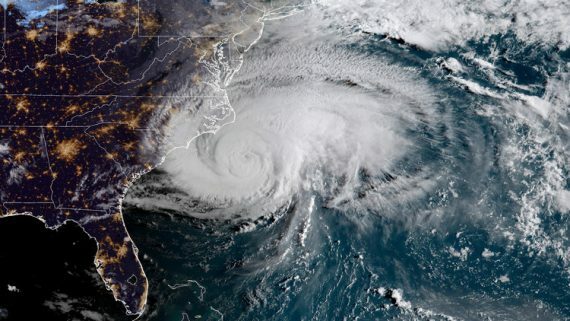 For more information on stormwater runoff, visit the EPA’s “After the Storm” website. Use our lesson plan, Big Book of Turtles to compare sea turtles to other turtle species, like the spiny softshell. 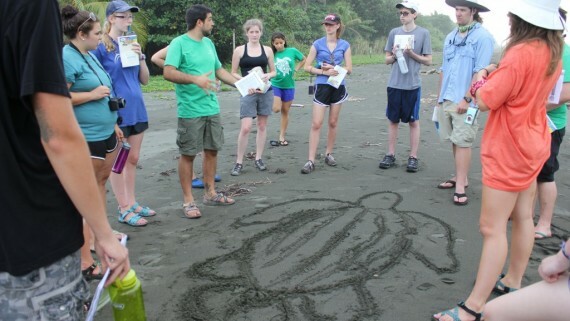 Or use our lesson plan Draw a Turtle, to learn about the characteristics of all three different types of turtles. Or you can track our hatchling growth with our Hatchling to Yearling lesson plan. Turtle A is now 12.1 cm long and weighs 338 grams and Turtle B is 11.3 cm long and weighs 293 grams.